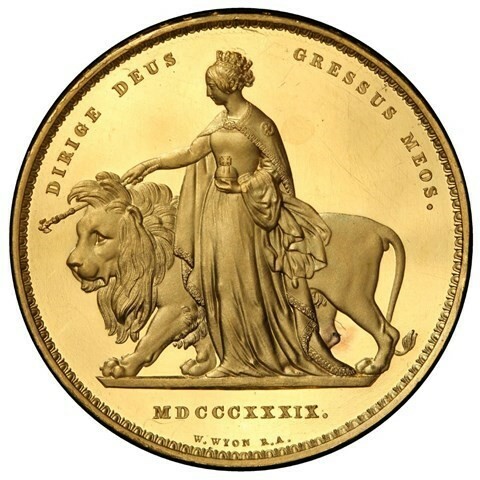 We are proud to offer the 1839 “Una and the Lion” 5 Pounds, Proof 64 Cameo for public purchase. A rare large and valuable gold coin, a masterpiece available for serious investors and collectors. The “Una and the Lion” is one of the most beautiful British rare gold coins ever struck and no examples have been graded higher than our PR64, only 6 remain in the world. This coin was designed by master-engraver William Wyon and is based on the famous fairy tale of the young Una and her story of vanquishing the Dragon with the help of the knight George, with the red cross on his armour that became the symbol of England. On the reverse of the coin, Victoria is depicted with sceptre, lion and the St. George cross. 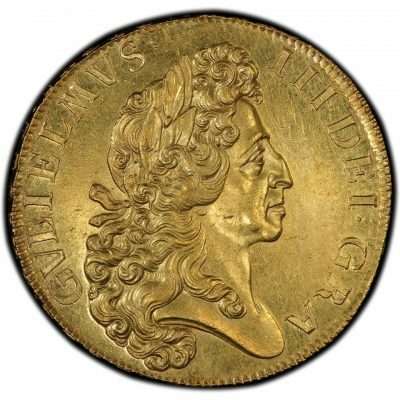 This rare gold coin is one of the most sought after in the 5 Guineas series, later called 5 Pounds. Collectors want important coin series. What makes a series important? Great Britain and its colonies eventually evolved into the British Empire, the world’s largest in history. The famous saying, the sun never set on the British Empire, helps define the scale of global demand from collectors and investors. As the world’s largest coin made for commerce, the 5 Guineas and Pounds has great respect for its grandeur. After over 350 years it is still todaythe flagship denomination of Great Britain. 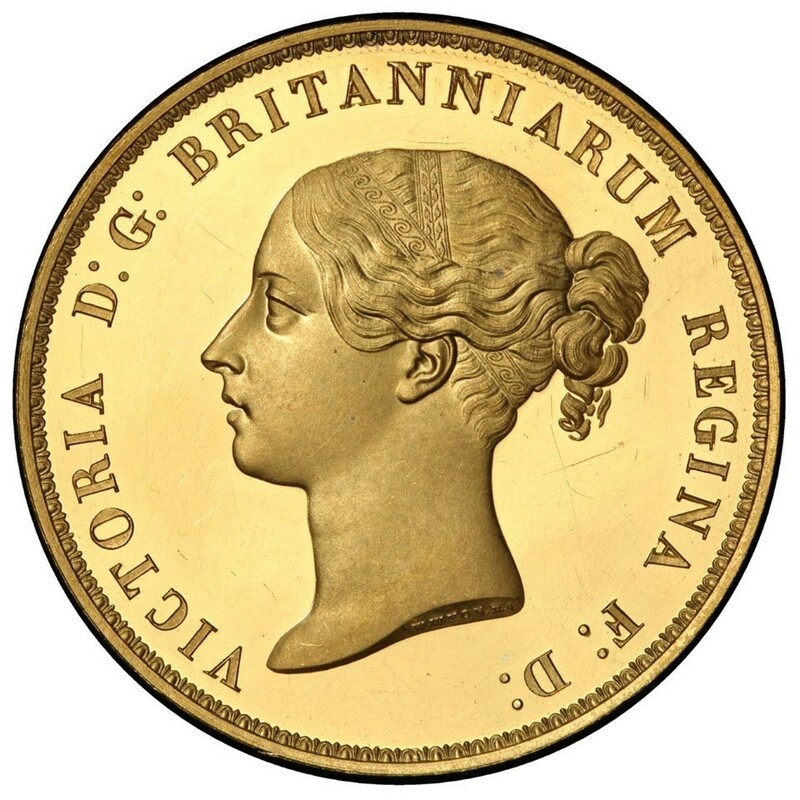 The 5 Guineas and Pounds is the world’s longest running large gold coin series. These great coins are the ultimate forms of art made in gold. Generally, major rare gold and silver coins have risen on average 11% per year since 1900. The “Una and the Lion” has been increasing at auction hammer price over 100% in recent years. Though this is a very rare gold coin, with a mintage of just 400, there are a number of variations of the “Una and the Lion” 5 Pounds gold coin; indeed, Wilson and Rasmussen identify a total of nine different varieties. Between NGC and PCGS, there have been a total of 60 examples certified in all grades. Without making a distinction between services or cameo designations, the breakdown by grade is as follows: PR60: 1 PR61: 3 PR62: 18 PR63: 32 PR64: 6. There are no examples graded higher than PR64. What this shows is just how rare the PR64 grade is for this large gold masterpiece, with only the top 10% of the graded population being 64’s. In recent years we have seen a huge growth in the popularity of the “Una and the Lion” 5 Pounds with prices increasing from £40,000 in early 2014 to the World record breaking auction price of £504,000 for a complete set in late 2015. This would value the individual 5 pounds at over £350,000.